Suzanne and her team recently completed a 4,500 square foot office design for Coppei Partners, aimed to capture the company’s culture in every inch of the space. Located on Mercer Island, WA, Coppei Partners is a consulting firm made of seasoned and skilled professionals who provide their clients with transformative strategies on Project Leadership, SAP Implementation Services, Technology Solutions, Change Management, and People Development. With the redesign recently completed in September 2017, Coppei’s office space is now able to accommodate their growing firm and support their highly collaborative environment through an innovative use of space. 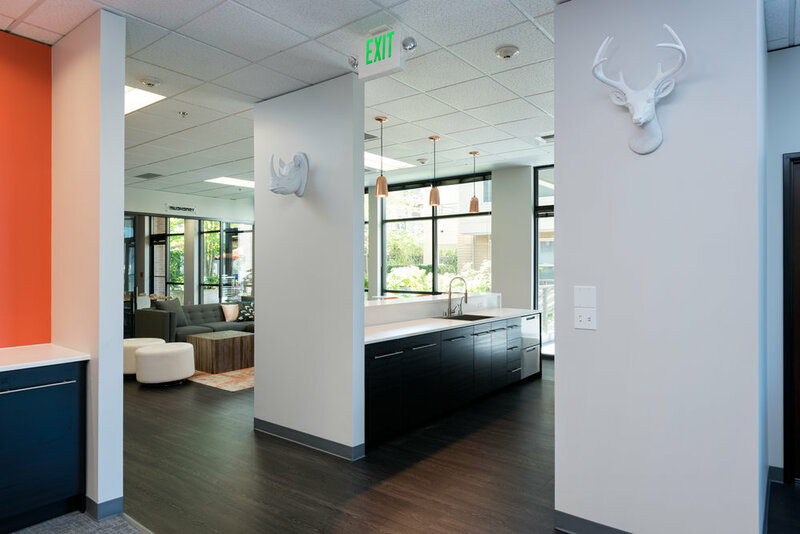 To share more about how the remodel has influenced Coppei Partners, I corresponded with Carrie Dallas and Travis Larsen of Coppei Partners to ask how they’re enjoying the newly designed space and how they imagine it will help the company continue to grow. The Q&A has been organized based on the variety of questions, which pertained to productivity, company identity and culture, scaling the business, and any other thoughts. Julia Hess: How does physical layout help your employees achieve daily tasks and goals? Carrie Dallas/Travis Larsen: Coppei’s value to our clients is to partner with them to provide strategic, transformative advisory services. This often involves working through the complex challenges of disruptive technologies and designing optimized processes to help our clients achieve their business objectives. Our modern office space was thoughtfully designed to support collaborative and creative working sessions that allow our teams to develop solutions for our clients in an accelerated fashion. JH: Is your team able to collaborate well with each other in this new space? If so, how? CD/TL: Absolutely. The space was designed and built to allow the formal and informal spaces to flow seamlessly into one another. Perhaps a group of 2 or 3 consultants will jump into one of the focus rooms and draw up a proof of concept, which gets translated moments later to a member of the leadership team in their office on a wall of whiteboards. Nearly every square inch of the office space was designed for collaboration. JH: Are they able to also do focused individual work when necessary? CD/TL: Yes – when required, our team members can go into an office or focus room and shut the door. These spaces allow our team to retreat to quiet spaces when it’s time to focus on individual tasks, items that deal with sensitive information, or to make phone calls. JH: Do you feel that your new office space gives you a recruiting advantage over your competition? CD/TL: Our talented team, client roster, team culture, and reputation as strategic innovators are our greatest recruiting advantage; however, our new office space allows us to showcase all of those attributes. The world class design and attention to detail tell a story to our prospective candidate employees and clients all by itself. Our office is truly a showcase, and each storytelling wall and pre-planned company branding space was carefully and intentionally designed by Suzanne Zahr and her team. Positive energy was designed directly into the final product of our office, and the energy is tangible enough to be felt with your first step through our doors. JH: Is your company's identity and culture well expressed through the new design? CD/TL: Most definitely. The design is fun and creative, but smart and polished at the same time. Our clients are the leading innovators in their respective industries, and our new space expresses how Coppei plays a vital role in driving meaningful solutions for our clients. JH: How do you foresee the new space contributing to employee retention? CD/TL: Our team is very excited about our new space. The space was crafted so specifically to the needs of our firm and with such quality that it inspires confidence in our team that we are investing wisely in our future. Since the space is incredibly functional and comfortable, our team is re-energized to push our creativity to new heights, and this creates a fun and imaginative environment. The office design attracts people to come together to solve problems, share best practices, and work together as a team which always contributes to employee retention. JH: Does this new space provide more flexibility for company growth without having to take down more square footage? How does the office allow you to meet the changing demands of business? CD/TL: Yes – one of Suzanne’s many rare qualities is her ability to look into her architectural crystal ball and program a space that almost magically scales as the need arises. Suzanne and her team examined the space from every conceivable angle and thought through a multitude of growth scale models that were ultimately built into the space. With a small tweak here and there, our space cannot only transform to meet the needs of our continued growth, but it can also transform to support our purpose-built solution center, client offsite workshops, Coppei social events, and endless other activities. JH: Is there anything else you'd like to add in regard to Suzanne and her team's creative contributions? CD/TL: Suzanne and her team dedicated themselves to understanding our core business functions, our value proposition, our work styles, our culture, and our team as individuals. Suzanne’s design is the physical embodiment of our firm, which is a talented feat to create. She is personally involved in the process from the sourcing of the raw building materials all the way through until the last piece of artwork is hung, and her choices for textures, colors, flow, hardware, workspace materials, and the like are second to none. Suzanne and her team are truly gifted, and there is no question as to why she has garnered the incredible reputation that she has in the industry. To learn more about Coppei Partners, visit their website.